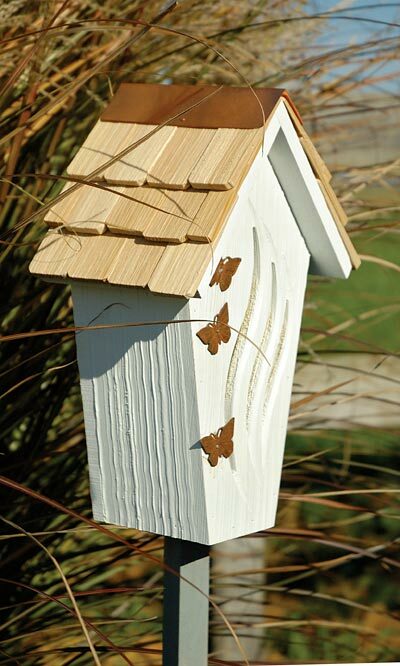 Bring a delicate shelter to your garden with the Heartwood Butterfly Bijou House and Pole. The narrow base and wide top of the home bring a whimsical feel to the item, and the three curved entrance slots offer a bit of movement. Three copper butterfly appliqués rest on the face of the home, inviting real butterflies to enter for shelter. Additional copper flashing at the top of the roof adds a cohesive look, while the cedar shingles lend a realistic feel to the item. A copper panel on the back of the home enables you to add a bit of twigs for additional hiding spots. The crisp white finish creates a vivid accent in any surrounding. Place this home on a flat surface, or use the included gray pole to stake the item in the ground. The solid cypress construction will withstand the elements for several seasons. Entice butterflies to inhabit your garden with this Butterfly Bijou House and Pole. Made in the USA.